The Cooking Blog of Emilie French Chef: Crispy Swiss Cheese Nuggets with "La Vache qui rit" ... the "Laughing Cow" !! Crispy Swiss Cheese Nuggets with "La Vache qui rit" ... the "Laughing Cow" !! I bet the first time you tasted this piece of "triangle Cheese" you said : "Is that Cheese, really ??" - "It's not bad, it's not good, it tastes almost nothing !!" - "Why is this cow always laughing, does she make fun of me ???" Tonight I decided to make some "Croquettes croustillantes de Vache Qui Rit" ("crispy Laughing Cow Swiss Cheese Nuggets"). 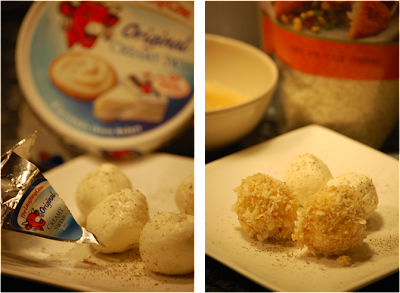 Imagine a crispy ball with a warm, melted Swiss Cream Cheese inside ... say moooo !!! Believe me or not, from now on you will always have "Vache Qui Rit" in your fridge !!! These small Croquettes (Nuggets) are great Appetizers to go with a glass of wine, and they are also perfect with a green Salad on weekdays !!! Remove the 12pieces of Vache Qui Rit pieces from the fridge and sprinkle them with Salt & Pepper. By hand, make a ball with each piece (sticky !!) and arrange the 12 balls on a platter. Put them in the freezer 30 minutes. In a bowl beat eggs, salt and pepper. Roll the balls of Vache Qui Rit in flour, then in eggs and finally roll in breadcrumbs. Once again, roll each ball in eggs and finally in breadcrumbs. Place on Paper Towel to remove the excess of fat and serve warm with a salad or for appetizer with a toothpick. Wanna try a Sweet Red Pepper Cream Shot ?? ?